A few years back I took a 3-day painting class at Art & Soul with Dan Carrell. We each painted an amazing landscape using his tried and true method of textures and glazes. Check out his book called ‘Realistic Painting Workshop: Creative Methods for Painting from Life’ here. I treasure the painting I did that week, but I don’t know if I could do another. He held our hands and led each of us thru the many layers until the very end when he helped me ‘Light the Candles’ on the painting. He said that painting was like baking a layer cake, and at the end, adding the final little details was like lighting the candles on the cake. You already know that I am an art class junkie… knowing that each class I take adds another layer of knowledge and experience to my work. Right now I am building jewelry for our Friends’ Pop-up Shop in November. 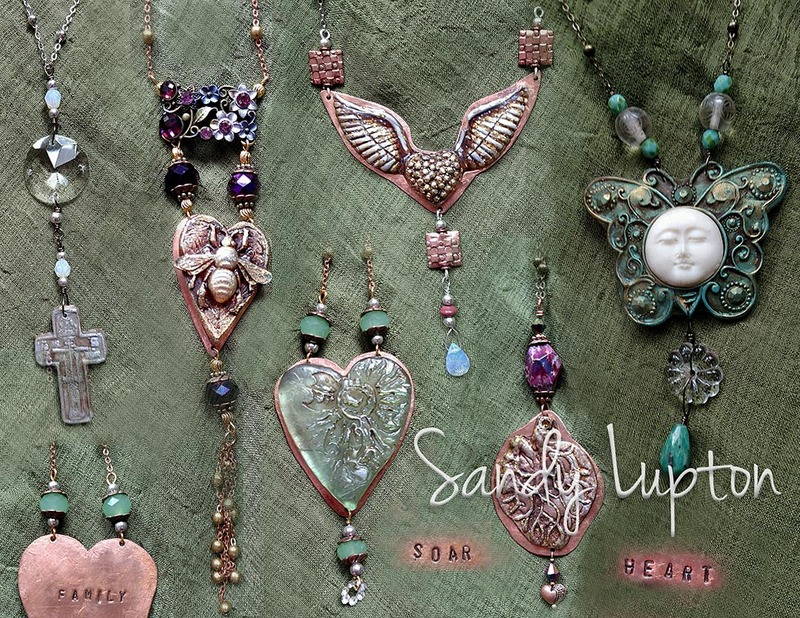 These jewelry pieces are a product of many, many classes— soldering, resin, wire, metal work, painting, patinas, beading, clay, assemblage, leather and more… and as I finish each piece, I am asking myself how to light the candles on it. Sometimes it means adding an extra dangle, an extra flash of light, an extra color or special bead. Some have words on them that only the wearer can see — hidden in plain sight to wear next to their heart. My advice to anyone who wants to make better art or jewelry is to take as many classes as you can. You might not think that a painting class can help your jewelry making, but it can. Open your mind to the possibilities and light the candles! I take some classes online, some at local art institutions like the Rawls Museum Arts, the Suffolk Art Gallery and Suffolk Art League, and some at Art Retreats like Art & Soul. I’ve been attending Art & Soul each year since 2008 and I have enjoyed each and every class. This year I am slated to take classes in resin, metal, abstract painting, soldering and polymer clay. Hope to see you there. This entry was posted in Uncategorized and tagged art and soul retreat, art classes, dan carrell, jewelry making, painting, workshops by Sandy Lupton. Bookmark the permalink.